THE DIOCESE OF L. A. Father Michael Ibrahim was born in Egypt on June 15, 1966. He earned a Bachelor of Arts from Ain Shams University in 1990. He worked as Executive Operational Officer for an Import-Export Company from 1992-2004. He served as a head servant of the High School Servants in Saint Mary Coptic Orthodox church, Masarra, Shubra in Cairo, Egypt from 1998-2004. Father Michael Ibrahim was ordained Presbyter on February 26, 2004 in Egypt by H.H. Pope Shenouda III along with His Grace Bishop Serapion to serve in the Dioceses of Los Angeles. 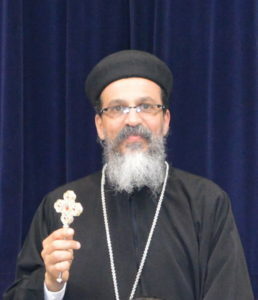 Father Michael Ibrahim was appointed to serve as the main clergy of Saint Mary Coptic Orthodox Church in Victorville on May 28, 2004. Saint Mary Coptic Orthodox Church Victorville California congratulates the beloved Fr. Michael Ibrahim on the 13th anniversary of his ordination. May our lord and savior Jesus Christ bless his service. Wishing him a year filled with abundant blessings. Watch Fr. Michael Ibrahim Ordination Ceremony and his reception at Saint Mary Church in Victorville.